You can make the case that if LeBron doesn't go to the Lakers, they'll be fine. The same can't be said for the Cavs if LeBron doesn't stay in Cleveland. 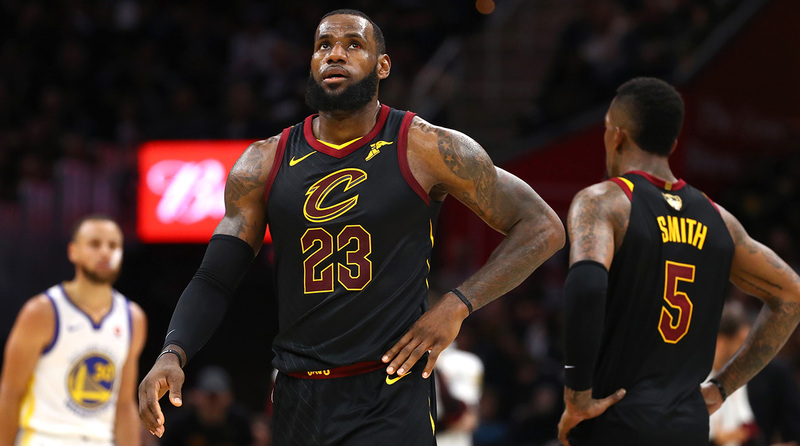 NBA free agency is on the horizon and LeBron James has reportedly informed the Cavaliers of his decision to forgo his player option for next season. With the Lakers the presumed favorite, the Open Floor crew takes a look at some of the options Cleveland should consider in the event that James leaves. Subscribe and listen to the latest episode of the Open Floor podcast here. Andrew Sharp: One thing I want to get into is the initial Woj report that's premised on the idea that LeBron will not go to L.A. without the commitment of Paul George or Kawhi Leonard before he commits. I don't necessarily think that is true. I think the appeal of the Lakers this summer for him is that they have rich assets and they will have the opportunity to build out a team around him with stars that he kind of handpicks; whether that is Paul George or Kawhi this week we don't know but LeBron can easily go there and then three weeks later they trade for Kawhi. It is really shaping up to be pretty similar to the move to Cleveland in 2014; where the outlines of a good team is there and LeBron is going to be taking a leap of faith. I think LeBron probably trusts Magic Johnson and Rob Pelinka more than he does in whoever is in Cleveland's front office and that could be the deciding factor. Ben Golliver: If he goes to L.A. and Paul George is not in tow then I want my money back on this three-part ESPN series about Paul George's free agency decision. Golliver: If you need three parts of a video to re-sign with Oklahoma City: give me a break. We are already not the world's biggest Playoff P fans around here. Sharp: We really aren't. He's not helping himself (laughs). Golliver: If it takes 18 minutes of behind-the-scenes footage for him to go back and play with Russell Westbrook, give me a break. Can I make one point on LeBron's decision? I am not sure everyone else made it. It might go along with what you just said about if he goes to the Lakers they are in a position to be solid going forward. When you look at all the teams in the LeBron James derby most of them will be OK if they don’t land LeBron. You can even make the case that the Lakers even if they struck out on these big stars, because of this young core, they will at least enter next season with positive momentum. It would be embarrassing if they just got none of these three guys, there is no doubt about it but they wouldn't be devastated. The only exception here is Cleveland. If LeBron leaves Cleveland, I don't think we have spent enough time discussing how awful and utterly decimated they will be and how quickly they could put themselves in position to just be the worst team in the league period. So consider this: let's say LeBron leaves and they get nothing in return for him, all they have to do is put Kevin Love into a trade scenario maybe to Oklahoma City. Let's say Paul George goes to L.A. and LeBron goes to L.A. and they could trade Kevin Love to Oklahoma City and let him pair with Russell Westbrook and take back simplistic contracts and any drafts picks that they could grab, at that point your best group is George Hill, Collin Sexton, J.R. Smith, Tristan Thompson. You're already a 22-win team at that point and you can do some auction and move Thompson to some contender who is in need of a versatile big. Maybe you can try to sell off Kyle Korver. You can get yourself to a point if you’re Cleveland with two phone calls; you can be a 15-win team next year very easily. When LeBron left the first time they were a 19-win team after the first year he left and that let them get the lottery picks that got Kyrie Irving and Tristan Thompson. This strategy has basically worked for them in the past and not to mention going cheap and selling off as many contracts as possible would definitely appeal to Dan Gilbert given that he had these massive luxury tax bills that he has financed over the last four straight Finals runs. The backfire potential if LeBron James leaves Cleveland is massive but I think it could wind up being a very clean teardown if you are a Cavs fan. I think that if you are a Cavs fan this is what you should be rooting for. Boom-or-bust. Boom if LeBron stays but bust if he leaves. Trade Kevin Love within 24 hours and have that trade ready to go and you are the league's worst team and you will try to catch everybody in 2020 once you have a few more lottery picks to build around. Sharp: I am not a Cavs fan so I don’t want to speak on their behalf but I have to imagine that after the last four years of weekly melodrama, it would be a kind of a relief and be like screw it, let's tear it all down and win 15 games and gun for R.J. Barrett at the top of the draft. That is not the worst thing in the world. The Cavs fans that I have interacted with over the last month or two all seem to be in a pretty good place with all of this and I am happy for them. They are the most emotionally balanced fan base of anyone who is in the mix over the next couple of weeks. Golliver: What I would do if I was a Cavs fan, if all this plays out like their worst case scenario here, I would spend all of next season watching the 2016 NBA Finals over and over again. And I would just then talk myself into Collin Sexton being the greatest player. Sharp: The 2016 NBA Finals was so cool that if that happened to me as a fan I could live off that for 20 years without caring about anything else. That is part of the reason why they are being strangely mature about everything else because that was so cool nothing else matters. Golliver: This is how you pass the time if you are them. It will get ugly. 15 wins is not going to be fun. You might have visions of Byron Scott like flashing through your memory bank, it could happen. But you are going to come out in a better spot if you just rip everything down this summer. That is my plan for Cleveland if LeBron walks.